Not every theatrical reveal lends itself perfectly to Electro Kabuki, though most do. 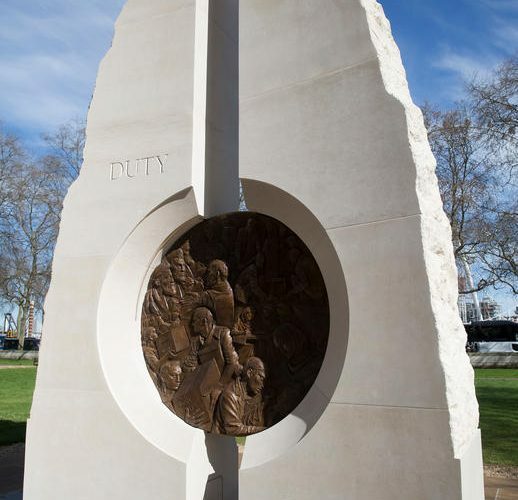 But this high-profile event, staged by our very good friends at FE UK Ltd, demanded a perfect reveal for a new war memorial sculpture in London’s Victoria Embankment Gardens to be unveiled by The Queen. The drape covering the sculpture needed to drop to the ground for the reveal, with the world’s press watching and beneath the gaze of 2500 military veterans. No pressure there, then! What exactly does Kabuki mean? Kabuki is a form of traditional Japanese theatre featuring classical dance-drama, with its roots back in the Edo period early in the seventeenth century. It is an art form rich in showmanship. Kabuki theatre is known for its elaborate costumes, eye-catching make-up and outlandish wigs. Not to mention the exaggerated actions performed by the actors. Of more relevance to our adoption of the term kabuki, as in Electro Kabuki, is the driving force behind the desire to manifest one frequent theme of kabuki theatre, namely that of the sudden, dramatic revelation or transformation. Kabuki theatre uses dynamic stage sets, such as revolving platforms and trapdoors to allow these rapid changes of scene (or the reveal and disappearance of actors) for which the genre is famed. So now you get the picture. Electro Kabuki does just that, of course. It is used the world over to quickly reveal something or somebody, delivering a rapid scene change. Here’s a kabuki fact that has no bearing whatsoever on our Electro Kabuki systems and modules! When it originated, kabuki was acted only by women and was popular mainly among common people. Later during the Japanese Edo Period (1603 to 1867), a restriction was introduced by the ‘Tokugawa Shogunate’ (the last feudal Japanese military government that existed between 1600 and 1868) forbidding women from participating. That edict obviously stuck as, even today, traditional kabuki theatre is performed exclusively by men. Several male kabuki actors are therefore specialists in playing female roles. They are called onnagata or oyama, which loosely translates to ‘female-role’. Kabuki theatre is now recognised as one of Japan’s three major classical theatres (the others being noh and bunraku). Kabuki was inscribed on the UNESCO Intangible Cultural Heritage Lists in 2005. Our thanks to Wikipedia for providing some of the additional detail above. To find out much more about the fascinating early days and incarnations of kabuki, follow this link https://en.wikipedia.org/wiki/Kabuki to the Wikipedia page. 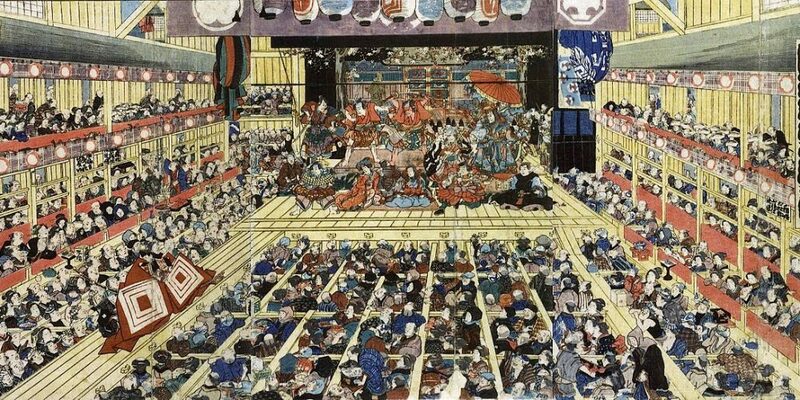 Read how kabuki was, essentially, an early form of pop culture in Japan that brought together people from a variety of social classes, much to the displeasure of the government. Find out about the link with teahouses that surrounded the theatres and its popularity in the Edo (now Tokyo) red-light district. And how the original ensemble and dance performances by women troupes featured “ribald and suggestive themes” with its appeal further popularised by the fact that the performers were often available for prostitution. Sounds like quite a night out, doesn’t it? Or perhaps a whole day out, as early kabuki performances ran from morning until sunset. Today, kabuki performances still run during the day and are usually divided into two or three segments from early afternoon into the evening.